This page is dedicated to give you an idea on what goes on behind the scenes. For this we have chosen for you some of our most interesting cases and stories. Our first case is that of Maggie, a 6 year old Ferret. Maggie came to us as she had an ulcer on her left eye which quickly became swollen. Unfortunately the ulcer was too big to treat medically and ran the risk of getting deeper, causing more discomfort and a potential rupture of the eye. In Maggie's case the only option was to surgically remove the eye. 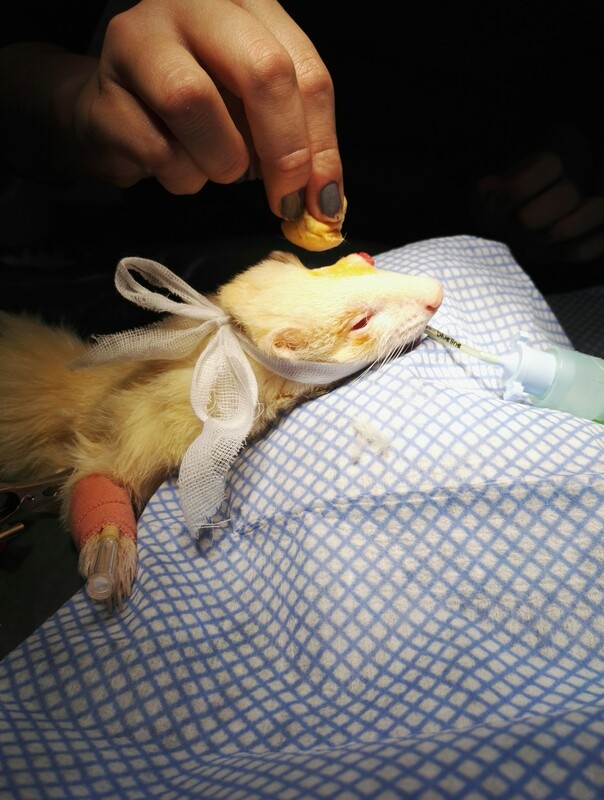 For this, Maggie had to undergo an anaesthetic which in a small exotic pet can be extremely risky. We always aim to reduce the risks by following the best standards of care. For her anaesthetic she was monitored with our multiparameter ECG/ Respiratory machine and by our nurse. A second nurse was on hand to pass instruments as needed by the Vet. This ensures the anaesthetic nurse is never distraced from monitoring the patient under anaesthetic. She had a catheter and tracheal tube placed and the complex surgery was carried out by our Vet. Maggie made a full recovery and was a great patient throughout. She was able to go home the same day. We will keep you up dated with Maggie's progress when she comes back for her post op check. Ada, a 10 week old Coton De Tuleur puppy, was brought into us by her owner for a Puppy health. She had already had a puppy check and first vaccination at 8 weeks by the breeder’s vet; however her owner wanted to get her health checked after picking her up, as most new owners do. Our Vet identified that Ada had a heart murmur to the left side of the heart during the routine health check. One of the main aspects of a clinical exam is for the vet to check the heart and chest using their stethoscope. Peter felt that the heart murmur was possibly a congenital abnormality and recommended a heart scan. The scan showed that Ada had a quite rare, but treatable heart abnormality, Patent Ductus Arteriosus. Patent Ductus Arteriosus is a serious but treatable heart condition that can occur in puppies. It is a feature of animals and humans in the womb that the aorta and the pulmonary artery are connected by a blood vessel called the ductus arteriosus. Though necessary while in the womb, this connection should naturally rectify and detach when the puppy is born. Sometimes this does not happen and the two vessels stay connected. As long as these vessels are connected and the oxygenated and non oxygenated blood is mixed, putting a strain on the heart. This condition requires specialist heart surgery and the procedure is risky. Peter referred Ada quickly and she was able to receive this specialist surgery before the condition started to cause a problem to Ada’s health. We are happy to report that the surgery was a success and Ada has made a full recovery and she no longer has a heart condition. We were recently able to carry out her spay procedure safely and Ada continues to be a happy and healthy puppy.